See post in category ‘plays’ titled “The Silent Game; an interactive DesignPlay” here the entire play is done with nails of different sizes. 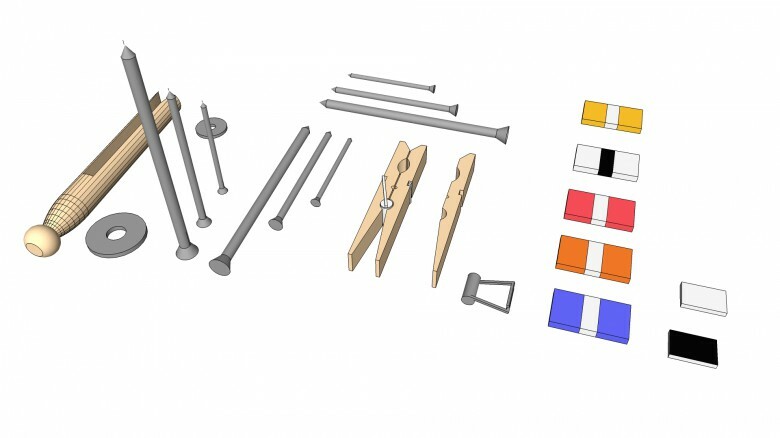 These nails were part of a larger collection of pieces like washers and parts of clothespins that are readily available in any hardware store and ready to play with. The library here gives these parts in SketchUp format. Playing with the real things is by far the fastest way, but if you want to convey the various stages of a play, or want to play with a partner who is elsewhere on the globe, the library here is ready for use. You will also find a few differently coloured slabs that we had made when the game was new. They can be used for an alternative library or be mixed with the hardware parts.